To bind them all about with tiny rings. One thing my mother never had to say even when I was in little polka dot frock was to eat peas. We kids at home loved our job of shelling sweet peas from their pods and collect all those bouncing little green gems in our little hand. Snap, shell and pop some peas into mouth; how simple is that? Knowing our love affair with fresh peas, Amma always bought large bag of shelled peas from farmer’s market. Little more than half of those little gems would disappear well before it was put into the basket and little more would easily disappear on its way to kitchen. I don’t remember when my love affair with peas started. It had to be love at first bite and I still can’t get enough of it. Although we can consume peas throughout the year as they are available in cans, dried form or frozen, they can never match the taste of fresh peas from their pods. I have been buying fresh peas from our farmer’s market as April, May and June are usually the only months that they are available fresh. So if you’ve never had fresh peas, straight from the pod, you’re in for a treat. Fresh peas are sweet and delicious and I feel they taste best uncooked as they are nutritious and low in fat. With overflowing peas in our kitchen we decided to use them in cooking. So we have been having good servings of Peas Pulao, Peas stir fry and Peas with different vegetables. When it comes to peas how can anyone not cook Matar Paneer. Fresh Peas of summer and creamy Paneer (Indian Cheese) gently cooked in thick gravy of onion and tomato seasoned with aromatic Indian spices and generous dollop of butter is a pleasure to savor. When served with soft Butter Naan it’s a treat for all your senses. Heat butter/ghee in a pan and shallow fry paneer cubes both the sides till they turn light golden brown colour. Immerse them in a warm water till required so that they don’t harden. To the same ghee/butter add jeera, star aniseed, bay leaf and kasuri methi and sauté till jeera starts to pop and splutter. Now add ground masala and fry it on a medium flame till oil starts to separate. Add finely chopped tomatoes, salt to taste and about ¾ to 1 cup of water and boil till gravy thickens. Add fresh/frozen peas, paneer and cream and cook for further 5-7 minutes over a medium flame. Garnish with chopped coriander leaves and serve hot with naan or roties. 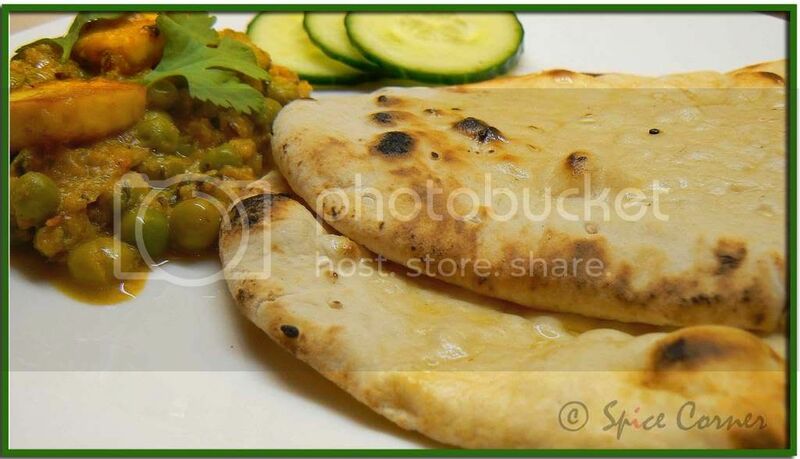 Naan is a round flat bread made of maida and cooked in a Tandoor or clay oven. You can make naan using pressure cooker or oven or grill or stove top. This time I tried Coffee’s Stove Top method which is not only easy but made beautiful tandoor style naan. Remember to use Cast Iron Tawa and NEVER use non-stick tawa for this method. Dissolve yeast in warm water and keep aside for 5-10 minutes. Meanwhile mix all dry ingredients: maida, sugar, salt and baking powder. To this add yogurt and oil and mix. Make a small well in the center and slowly add dissolved yeast water. Keep mixing till you get soft pliable dough. Cover this dough with a wet cheese cloth or plastic wrap and keep it in a warm place for 1½ to 2 hours till the dough rises and doubles its original quantity. Punch down this raised dough to release air and divide it into big lemon sized balls. Heat iron tawa and roll the dough ball into a ¼ inch thick oval shaped roti with a rolling pin. Sprinkle little sesame seeds and gently roll the naan. Sprinkle generous amount of water to one side of the naan and gently place it on the heated iron tawa. Remember to put the water side down. When you see bubbles forming on the surface of naan in few seconds time, lift the tawa and turn it down so that the surface of naan is directly exposed to the flame. While keeping the flame on high, move the tawa so that naan is cooked evenly. 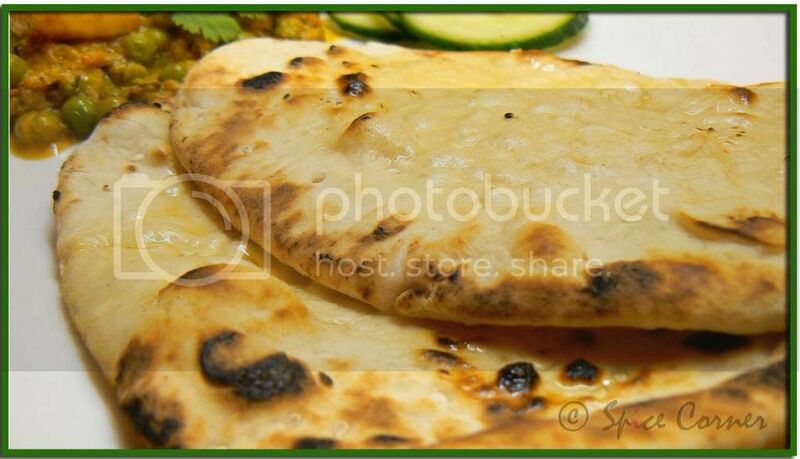 Naan is well cooked when you see brown patches on the surface of naan. Apply butter or ghee and serve hot with any Curry of your choice. PS: Thankyou for your concern and mails/messages. I was not be able to response to your comments and visit your blogs as I had crazy busy schedule. And more than that I am trying cope with the pain of losing a loved one who was very special to me in many ways. Till now I have only heard about the way how death touches others life and now I understand. This is the first time I am experiencing the pain of losing a precious one who was a backbone of our family. Matar paneer looks so good. I wish I could taste some right now! I am sorry to hear about your loss. I hope God gives you the strength to get through these difficult times. Matar butter, matar butter-quite a song here :-D. thats such a hearty platter, Sups! Good to see your post after quite a few days! How have you been doing, dear? oh sia, so sorry to hear about it, i thought your were generally busy with you work schedule.i know it is heartbreaking to loose someone close to you We all have to face the ups and downs of life. dairya tagalavo, be brave girl ! I also have coffee's stove top nan in my to do list. your pics make me hungry. Paneer and Naan never gets old. my hubby's favorite. I still have to perfect naan. Sia, so sorry to hear about your loss. Hang in there! Sorry to hear about the tragedy in your family. All the while I kept thinking that you were busy with work in the office. 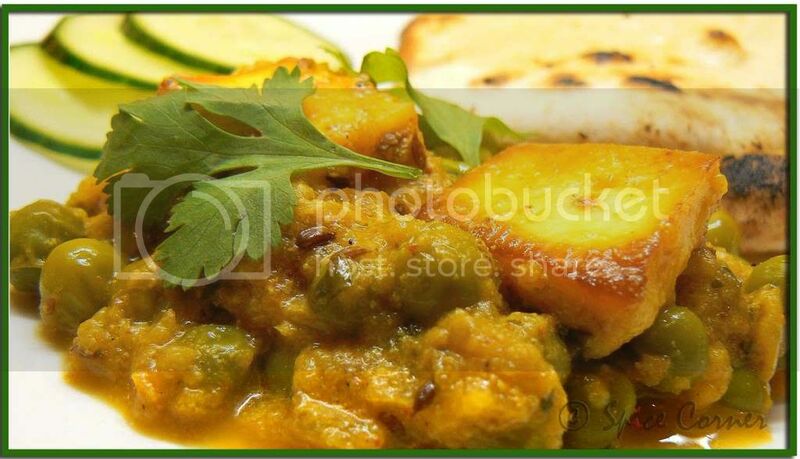 what a yummy and different recipe for mutter paneer. It must be really rich and creamy to eat. Great combo and a nice poem. Sorry to hear about your loss. Hope you get the enough strength to be back to normal. Sia, hugs to you, hope you get over the loss. So sorry read that Sia.Thathana, ajjina? My condolences to you and the family.Time will heal,take care.I thought you were just too busy.Take your time.Hugs to you my lil sis! I will post my Paneer Matar too later and I have N0-Yeast Naan in my post this week,easy e peasy one.Make it when you have time. Hi Sia, sorry to hear about your loss. Be brave girl. Love the first pic. Beautiful pic of fresh peas. Matar paneer is my favourite. Looks great. Thanks for sharing. Sia, my condolences to u and ur family! hugs to you, dear sia. we are so sorry for your loss. oh Sia!! this looks so good... the matar pic is awesome!!! Love the recipe! Oh..so sorry to read about the loss,sia.My condolences to you and your family. 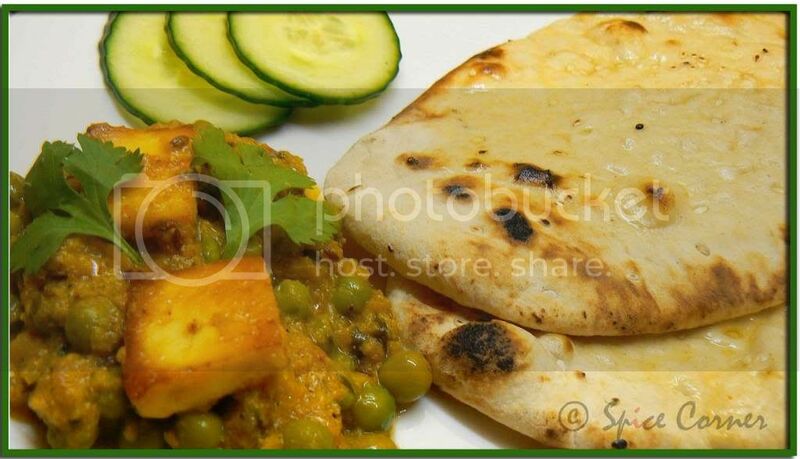 Matar Paneer and butter naan...i am sooo hungry seeing the pics ! Sia, I'm sorry to hear about your loss. Take heart and take care. Your matar paneer and naan look super delicious. Oh sia, so sorry to hear abt ur loss! I hope you are feeling much better now! You brought back memories of shelling peas, really that was a chore most kids loved. Matar Paneer & Naan looks out of the world. MMMM yummy sia.curry looking tempting! !the nann looks perfect. Hey sia, nice and tempting recipe.. nice one.. list added to my recipe..
Hey sorry to hear about the loss.. take care..im sure god will be ur side to give u strength.. Sorry to hear about your loss,Sia. Nice to see my favourite Indian bread along with my favvvorite sidedish.I love this Perfect combo..
My mouth is watering. I love paneer and one of my fave paneer dishes has to be mattar paneer. Sorry to hear about the loss in your life. I know this might sound lame - but time does heal a few wounds! Hey Sia... very sorry to hear about your loss, my condolenses to you, take your time to build up your strength, god bless..
Great pics. OH my god. I am drooling. :)I want to have a bite of those butter naans with that matar paneer. just checking to see how you were doing ? hope god gives you all the strenght to bear this loss. Sorry to hear about yr loss Sia. Hope you find the strength to pull yrself together. Those fresh peas looks lovely! btw sorry to hear your loss. So sorry about your loss, Sup! It's all the more difficult being so far away from home. My grandfather passed away a few months after I came to the US. I was devastated as I was very close to him. But I could not go back to India nor be with my family at that time. thanks sweetie:) i am happy that i did get a chance to talk to him few days back before he left all of us. thanks my dear:) i AM busy with office work too. but somehow i am enjoying this busy schedule as i dont get time to sit idle. thanks dear:) adding cashew paste indeed makes the gravy very rich and thick. Hugs girl. I lost 3 people that were extremely close to me and that I was extremely close to between Nov 05 and Nov 06. I agree with Meeta, time is a good healer. You will find the strength to overcome this loss. I know because I have. The dish looks absolutely yummy. it was my doddappa. he was like my grandfather i never had. i grew up playing in his lap as for the 1st 7 yrs of my life was spent living in a joint family. i dont have complains of store bought panner. may be it depends on the brand. we get (i forgot the brand) really good panner from india here in super market. its tastes really good, and thats a reason why i still haven't ventured into making paneer at home. thank u bee and jai. ifelt really bad for not being there with my doddamma when she needed me. i was shocked to get this news as i had spoken to him just few days bk before he passed away. he sounded reaaly good and was egerly waiting for our visit to india. made me feel bad coz i didn't get chance to say goodbye to him:( well, i know that where ever he is he is happy. thats really sad to know girl. i can very well understand what u must have gone through. hugs to u dear. 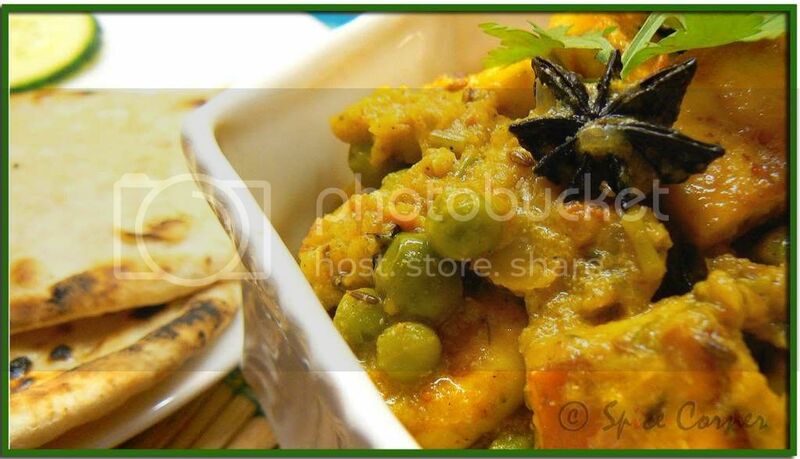 that matar paneer & naan looks absolutely lip smacking delicious. the marati maggu garnish looks pretty :) boy! i did miss blog hopping last couple of days. That is one lovely meal :) so sorry to hear about ur loss. 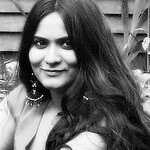 Sorry to hear about your loss supriya. Our thoughts and prayers are with you. The paneer and the naan look fabulous. Take care girl! Sia, I am sorry to hear about your loss. Please accept my condolences. The matar paneer looks awesome. 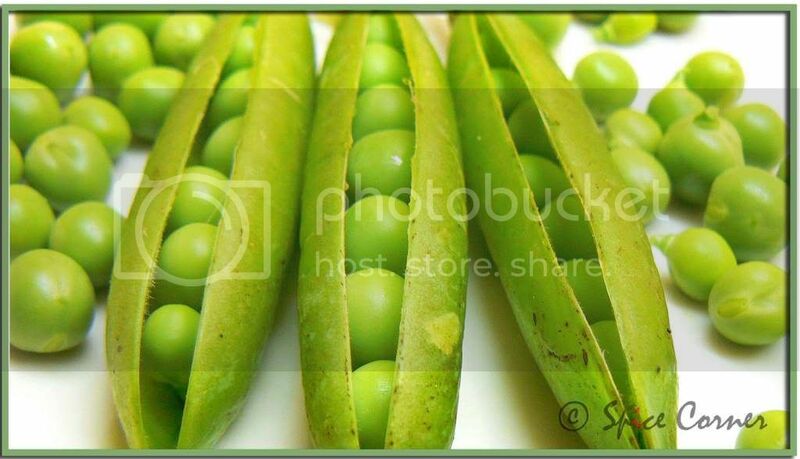 I have been using frozen peas for a very long time, the photo of fresh peas looks lovely. Sia, sorry to hear about your loss. The oft repeated advice (which is true but sometimes hard to remember through the sadness)...it will get better with time! !Guess a busy schedule always helps. Lovely pictures as usual - your blog inspires me to make some delicious traditional food. Hey Sia, Sorry to hear about your doddappa. Be strong girl. Your doddappa's fond memories will always be with you to remember him by. Thanks for the awesome recipe as always. I have a pack of paneer lying in my fridge.. Gonna try this one for tonight. your naan looks great ! i too made matar paneer few days back. yours looks yummy...! let me grab some of it now and a naan tooo :)) . its a deadly combination , i just love it. a perfect punjabi menu. :) . keep on sharing. sorry to hear the news. i am late as i was busy with so much going on.ur matar paneer looks delicious and yummy.i am going to prepare this.i never tried matar paneer.i make naan.this version i didnot try.will try. A friend of mine is your secret admirer of your blog, she has tried several of your recipes. I have a lengthy list of your recipes to try. Sorry to hear about your loss. Hope you and your family find strength to overcome this most difficult time. hw have u been doing? thanks dear for ur kind words. i am glad that i have been keeping busy with office work. thank u meena for being there. what??? u never tried matar paneer? then its a right time to make this and enjoy with naan. do post ur naan recipe also. good to see u dear:) how have u been? Sia, that is one luxurious treat one can have, I like the pics with that bold border, adding an edge to them. Nice post! Nimage ishtondu aduge maadodakke ellinda samaya siguthe. Dinadalli eshtu baari aduge maadutheeraa? Naanu idannella try maaduva hothige, nanna magana maduve aagiruthe. (My son is now only 2 & 1/2 year old). Devare Devare!!! Thumba thalme ide nimage. I was looking for Karnataka recipes and I think I have hit the right blog, wherein I can get all sorts of food. i am glad it worked for u zeb. it is indeed one os the easiest method for preparing naan at home:) i will surely keep updating with simple and delicious recipes as i too am a learner when it comes to cooking. Hope you are doing well, enjoy your weekend and have fun !!! I am not a first timer here. One of my cousins have forwarded one of ur recipes to me and i came here thru that mail:)And im glad i did. U have a wonderful space in here with beautiful pictures and awesome recipes. I just love the look of ur blog. One thing i wanted to know is which font do u use here in ur pictures. And i wanted to know how u put it in ur pics...i mean which software u put it thru... Pls reply me in my blog if possible. That would be very much appreciated. I made the butter naan, but its not as sticky as available in the restaurants or market. Made Butter Naan tonight, and it was a great success. Everyone loved it. Thanks for the recipe.